Nowadays, we often hear a more or less generic replica when talking with our friends about PCs: “If you want a real PC, get yourself a desktop”. Indeed, in general, this advice is, or at least, it used to be true. ASUS has “flooded” the high-end gaming laptops market, bringing together some of the most powerful components available today, along with a water cooling system on top of the Republic of Gamers line, namely ASUS ROG GX700VO and its dock, Hydro Overclocking System. Before I begin this Asus RoG GX700VO Review, I would like to point out something: the days when the most powerful components available on a laptop were, in a best case scenario, at leas a third as good as the desktop ones, are long gone. The high-end chips, especially those produced by intel, are using an identical core for both types of processors. Sometimes, the differences have to do with specific optimizations to limit power consumption and heat dissipation, so that laptops can effectively cool the CPU. In other words, take an i7-6820HK and an i7-6700K, tune them at the same frequency and most likely you’ll notice … nothing, there is no difference. Since Core2Duo, the laptops users have enjoyed impressive processor speeds. On the other hand, although the last 4 years have offered huge improvements in terms of computing power for the dedicated GPUs, there is still quite an important difference between Mobile and Desktop. Until last year, when nVidia have made available the complete desktop core of GTX-980… to notebooks. At that time, the enthusiasts from all over the globe began to dream and to imagine … How would the ultimate gaming look like? ASUS has chosen to answer this question by bringing the most powerful components available in this segment. And they also addressed the cooling issue from above. The memory is … a little ridiculous. The system contains 64 GB DDR4 memory at 2400hz, in four slots. The retail version will feature DDR4-2800hz memory. GX700’s case is silver, with a thin but strong build. On the lid and the upper part of the base, the material used is a combination of metal, the bottom being made from a plastic that is pleasant to the touch. Overall, the result is a good one. It will only keep fingerprints on the bottom plastic, where no one is looking. The screen has an opening of 130 degrees which, although it can’t be compared to some business PCs, is very good. The connectivity options of GX700 are varied, and we hope, resistant over time. GX700 offers 3 USB ports, a USB 3.1 Type-C, and a Thunderbolt 3 port. We are extremely interested in what this Thunderbolt 3 port could provide in the future, where the user might want even more graphics power. We don’t exclude the possibility of adding another graphics card. If it won’t be used for SLI with another GTX-980, then the DirectX 12 option remains. The card reader has an excellent performance with speeds up to 230 MB/s, and the Wi-Fi card is an Intel Wireless AC-7265 module, capable of WLAN 802.11 a/b/g/n/ac and Bluetooth 4.0 connectivity, with WLAN data rates of over 100Mbps. When it comes to maintenance, the access to the housing is relatively complicated and a hasty operation is not recommended. There are many screws that need to be removed before accessing the GX700VO. First, the gummed legs need to be taken down, then 12 screws, followed by two more hidden screws under the hinges of the screen in the connection of the water pump. It’s pretty complicated, and there is a risk of damaging the frame if you get distracted. That being said, how the cooling system is designed, is fascinating. 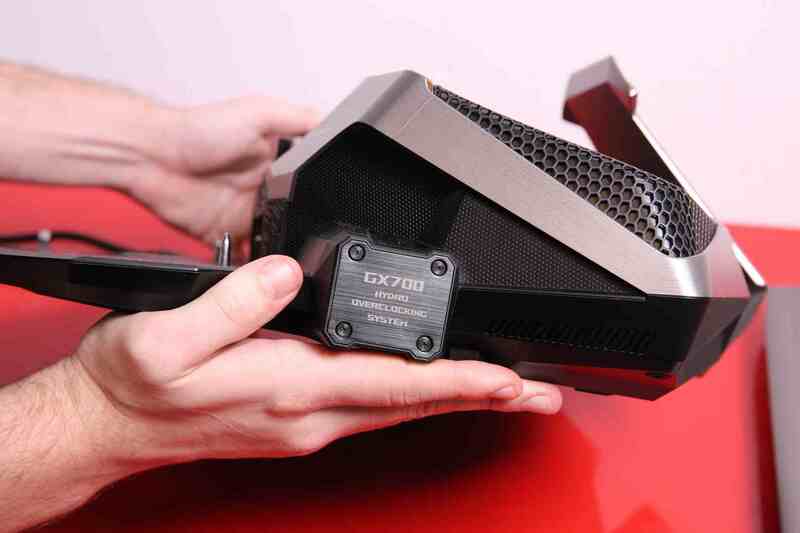 GX700VO offers two massive heat pipes, which interconnect the processor’s fan with the CPU and the GTX-980 (along with a water block on the motherboard core and GDDR5 memories), and finally connects with a second fan, which relates to the video card. It becomes quite obvious that the primary purpose of the water cooling system is to subtract from the burden of the heat pipes, allowing proper cooling of the GTX 980, not of the CPU. I didn’t mention the package yet. 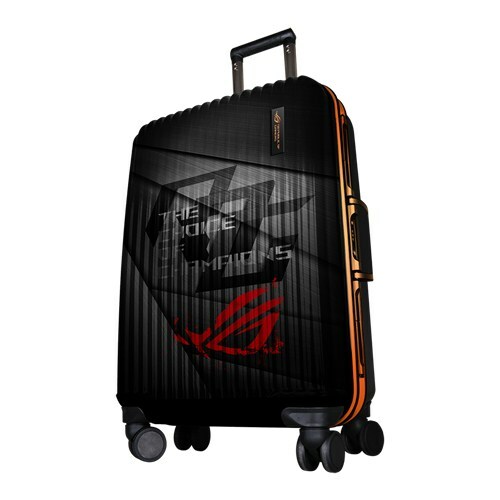 ASUS GX700 has definitely the pickiest pack that I’ve ever seen. The package is represented by … a black travel cabin bag. It weighs 27 kg and is clearly thought for less common trips. Its interior is divided in two. One-half contains the laptop, which is well fixed in polyurethane foam and secured with elastic bands. The second half contains the cooling system, two sources (a massive 330W one a smaller one of 180W), and a mouse with the ASUS RoG brand. I have seen laptops of all kinds, but definitely in the future, I will remember what was the first laptop with a water cooling system that I’ve played on. 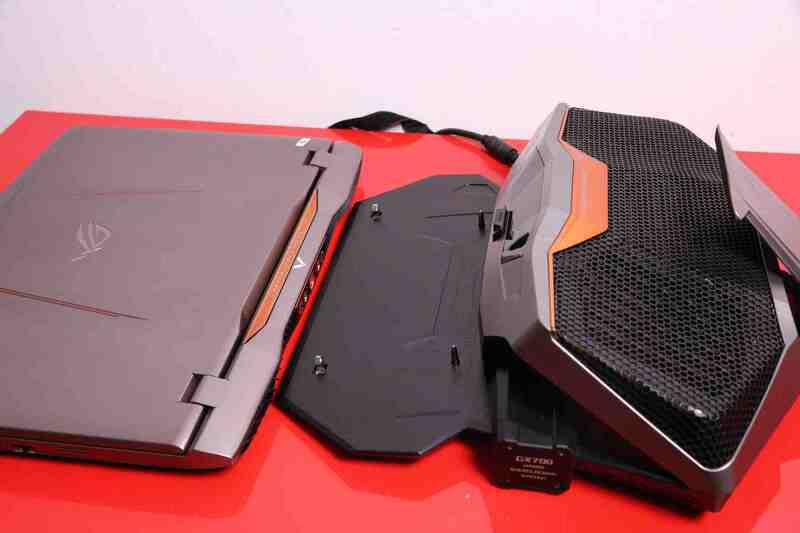 ASUS RoG GX700 is the first laptop on the market that comes equipped with water-block. 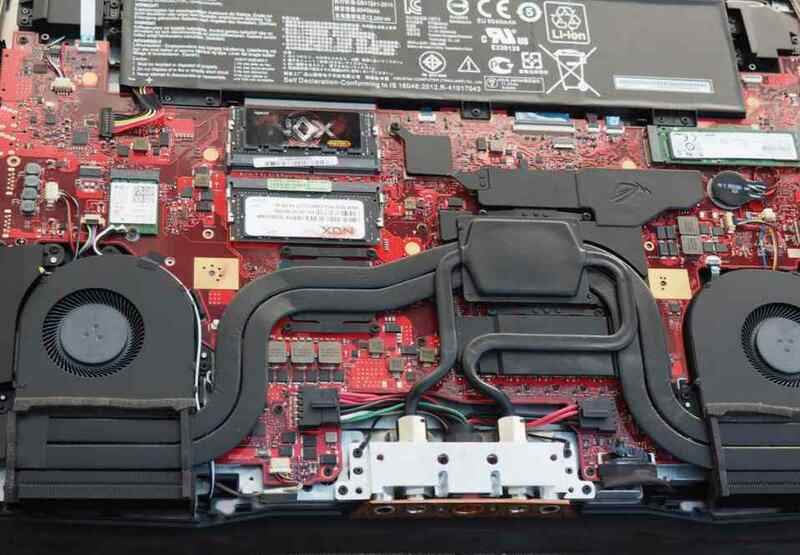 I am saying the first available on the market, because in the past, the engineers at Asetek have shown in 2012 an Alienware M18x laptop featuring a water cooling system, but their solution was never sold in the retail market, unfortunately. The GX700 Hydro Overclocking System designed by ASUS is, at least in the current version, an “add-on”, not a replacement for the traditional cooling based on air. 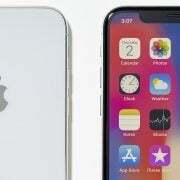 It involves two traditional heat pipes which are connecting the CPU and video card with two fans, with the water block placed directly over the video card and memory chips. Even if the system comes with a generous overclock straight from the factory, a CPU clocked at 4 GHz (an extra 11%) and a video card clocked at a frequency of 1200MHz, the temperatures generated by the components have indicated that there is enough space to push the system performance even further. More specifically, in terms of maximum load at higher frequencies, CPU oscillates around 76 degrees Celsius and the video card at an extremely low temperature for such a chip with a maximum of 59 degrees Celsius. Taking into consideration the fact that the GTX-980 is a chip designed to operate at up to 98 degrees Celsius values, we can only be extremely impressed with cooling capacities. There has bee a lot of talk about how noisy the cooling system of the GX700VO is and indeed, depending on the level of performance that is set, it is possible for the Overclock Hydro system to make more noise than a compressor. 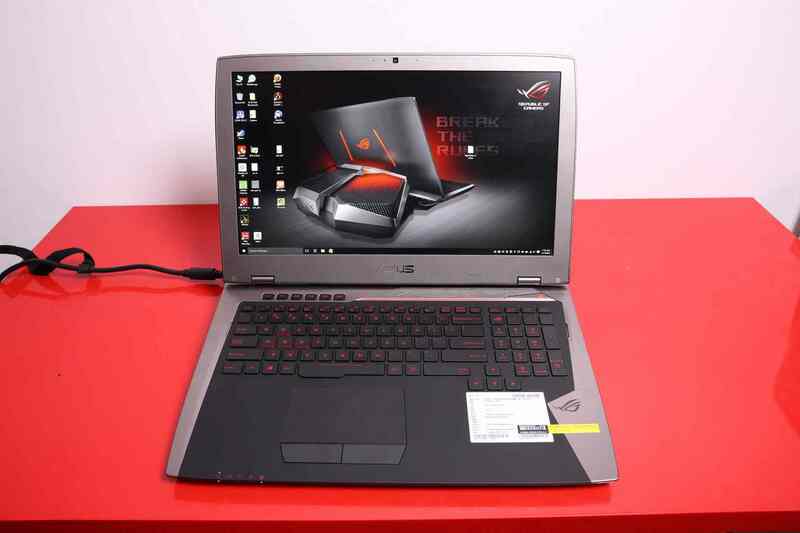 But ASUS offers the ASUS Gaming Center software, which besides the personalized performance profiles, offers the possibility to manually control the laptop’s and dock’s cooling system. After playing with the settings a bit, we found that a speed between 10-20% is more than enough to keep the system at an acceptable temperature and that without generating any noise. So, I installed MSI Afterburner and tried to see how far we can push the GTX-980 graphics card from GX700VO. We managed to set the core frequency at 1387MHz, along with 7100MHz on the RAM. At these frequencies, we ran a few sessions of Unigine Heaven, Unigine Valley, FurMark and 3DMark Fire Strike and Fire Strike. At this clock rate, the video card temperature has finally passed over the threshold of 60 degrees, reaching up to 67 degrees in FurMark 4K. This is an interesting value because it is almost identical to the ASUS GTX 980 desktop edition, like STRIX OC when overclocked. The problem is that the voltage required, namely 1.15 V, shattered out dreams for extreme overclocking due to insufficient electricity power. We want to clarify the fact that it represents an overclock of more than 22% over the basic frequency of 1126 MHz. 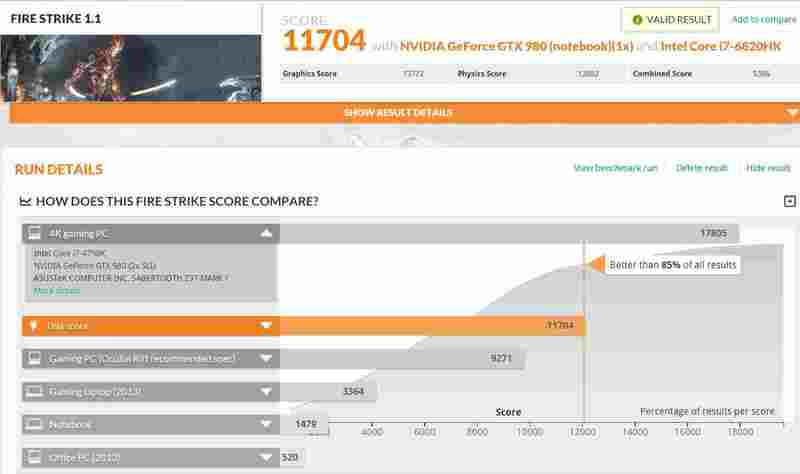 As you can see from the comparison table above, GX700VO’s performance is higher than 85% of all systems tested in 3DMark and higher than the recommended configuration for VR gaming enthusiasts. 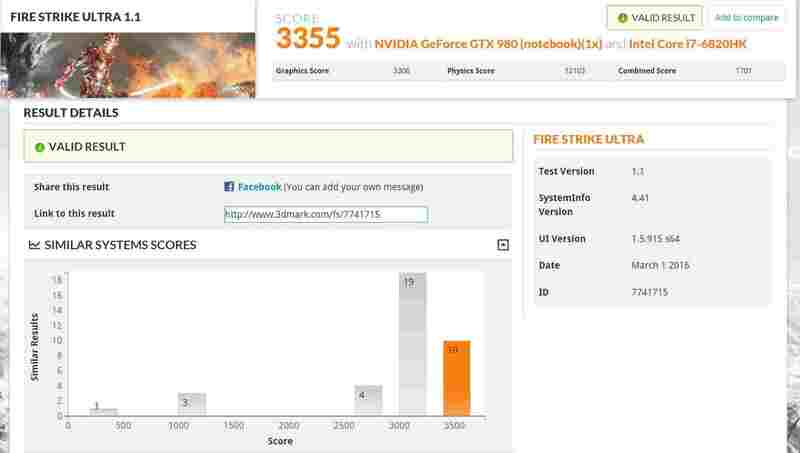 In 4K, the overclock kicks in, resulting a score that is in the top results for similar configurations. To make ourselves understood: the performance offered is exceptional, over any laptop that uses a single video card, MSI being the only real competition with their own GT80 and two GTX 980 in SLI, but that in a solid package, unsatisfying in terms of design and weights over 5 kg, not to mention the price of 5500 euros. Another consideration that would have been excellent to be taken into account in the case of the ASUS RoG GX700VO is the existence of the integrated graphics chip in the Skylake processor, and the absence of the nVidia Optimus feature. We are aware that Optimus can not be used together with G-Sync, but even without Optimus, we would have loved to have had the possibility to disable the GTX 980 at a hardware level. We say this because GX700VO is by far the lightest laptop in this performance class. It’s pretty and we believe that many users would have enjoyed the opportunity to have a laptop that can be used longer and away from the socket. Therefore, when watching a 1080p movie encoded in h.264, for example, you can expect around 2 hours of battery life, with a maximum of 3 hours when the system is idle. But let’s leave the brute performance aside for a bit and let’s talk about the actual experience of using this laptop: ergonomics, design, and display. 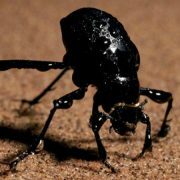 The display of the test version is Full HD, running at 1920×1200 resolution. The display shows an average brightness of about 320 lumens, the contrast of almost 900:1, and 85% coverage of the sRGB color. This latter aspect is not bad, but not exceptional. I noticed this phenomenon of backlight bleed, although my feeling was that the design of the prototype had the screen frame too tight, rather than a defect in the Panel itself. In terms of response times, a value of 22ms is extremely high for competitive gamers but much better than the average of this range, of approximately 30ms. In addition, the G-Sync function is a real benefit. Over the years, we were “used” with all kinds of inconveniences from the refresh rate point of view. If it’s too small, it’s not good … everything freezes and ruins your in-game immersion. If it’s too big … it’s not good either. The more efficient a system is and the worst a driver is optimized, the more vertical screen tears will be present in refresh rate. Well, with G-Sync and a GTX 980, this doesn’t happen. It’s really hard to find a game which GX700VO cannot handle. Whether it’s CS: GO, Battlefield: Hardline or Black Ops III, the performance is excellent and the frames are perfectly fluid. We wanted to try the Witcher 3 on a 4k display but never had the chance. In terms of keyboard, in Asus ROG GX700VO, we are dealing with a get-beget keyboard for gaming. It provides macro functions, a button for nVidia GameStream and NumPad buttons. The keyboard functions are accessed using the Fn key in combination with the F1 to F12 keys. The keyboard is illuminated in red colors characteristic of the ASUS RoG series. You can type very well on GX700. The chicklet design with rounded keys has a separation of about 3 mm. We have appreciated very much the full sized arrow type keys, often ignored by the laptop manufacturers in recent years. The keyboard is placed quite deeply into the chassis, leaving ample space to rest the palms. The touchpad is lined up under the Spacebar key, and is surprisingly big, with a height of 6.5 cm and a width of 12 cm. It is precise, the dedicated buttons are large and pleasant to the touch, and the ample space provided allow browsing the entire screen without having to lift the finger, as it happens with other laptops. The generous space is also useful when using multi-touch gestures in Windows, making it one of the few laptops which really lets you use gestures with the 3 or 4 fingers. But is it all milk and honey? 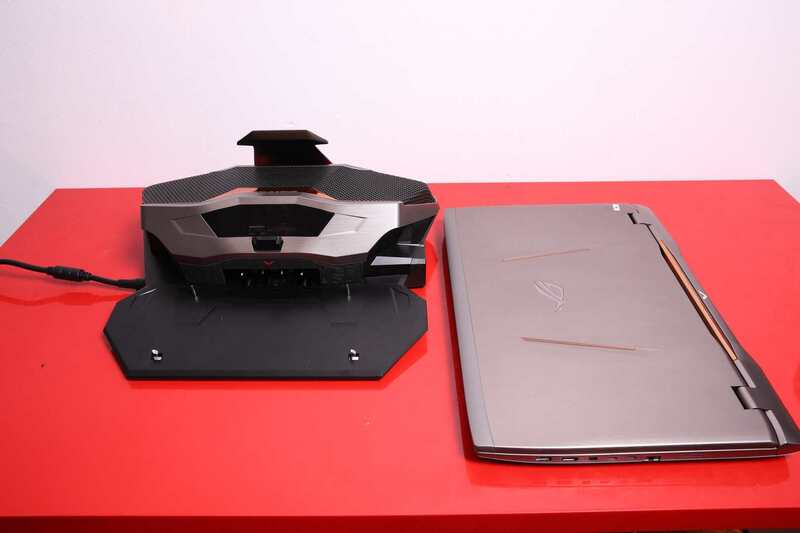 Could Asus offer us something extra to make the ASUS RoG GX700VO more attractive? Personally, I would have loved to see a completely unlocked BIOS, or, at least, the real option to enable overclocking functions native to BIOS, with the approval of the fact that such operations would be done out of warranty. I would have also liked the access to the CPU and GPU voltage settings to be “free”. There is possible to push both the graphics card and the CPU to the superior performance of at least 4.3 GHz on the processor and 1500MHz or more on the video card, provided we don’t crack source. In conclusion, our opinions regarding the ASUS Republic of Gamers GX700VO are divided. On one hand, many reviews have attacked this laptop because it’s very expensive and not very practical, due to the fact that the actual performance of the system cannot be achieved without the Hydro Overclocking System and some design decisions, in our opinion, are sacrificing more than they are giving in return, an example would be G-Sync, which cuts off any possibility of obtaining a real battery usage. On the other hand, let’s put things straight. 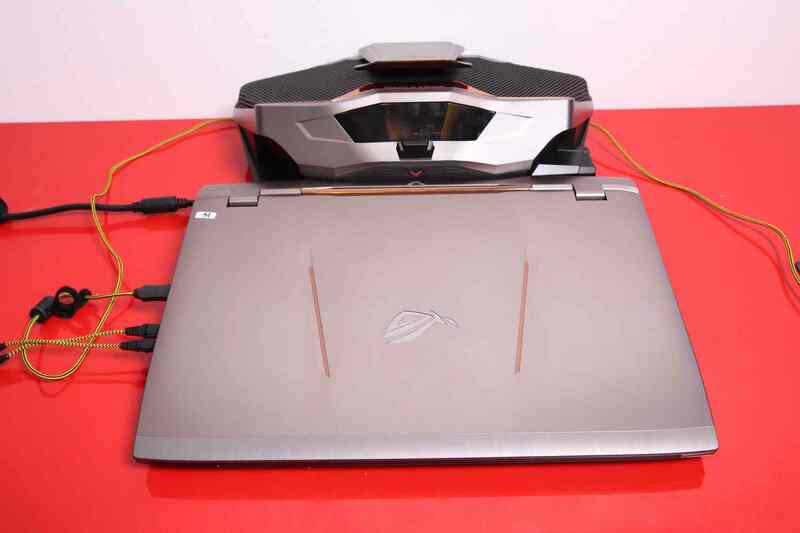 We are dealing with a single GPU laptop maximized not only for performance but for portability as well and ASUS RoG GX700 is definitely maximized. A quad-core i7 Skylake processor from the factory at 4 GHz, extra overclock available. A tremendous amount of the fastest memory available today. Storage secured by ultra-fast SSDs in Raid-0. A good screen, and no, we do not believe that 4K would make sense on this laptop because we are convinced that any buyer, like us, would not use the laptop screen as the main screen at home. An abundance of modern ports, two sources, a phenomenal cooling system, and even a travel cabin bag. 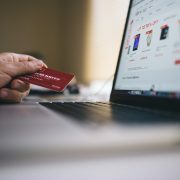 And like this wasn’t enough, when you go for a trip and you need to take a laptop with you, you will get one of the most lightweight, thin and portable laptops from this category. The whole system is carefully molded for a certain kind of customers, namely the enthusiast. The ASUS Republic of Gamers GX700VO laptop is dedicated to the enthusiasts and we believe that does its job above any expectation.